Cognitive Therapy Is Effective For Treating Tinnitus : Shots - Health News One in 10 U.S. adults has tinnitus. Cognitive behavioral therapy is one of the few interventions that have been shown to help, but it's rarely prescribed by doctors, a study finds. About 2 million Americans experience unbearable tinnitus. About three years ago, a high-pitched "eeeeeeeee" sound started ringing in Linda Gray's ears. Sometimes, the ring would suddenly turn into a roar, sending Gray into panic mode. Her heart would speed up. She'd try to find a quiet room. "You're trying to escape it. It's like, 'Turn this off!' " she says. A lot of people experience ringing, roaring or buzzing, also known as tinnitus. It can be maddening. "It consumed me, it really did," says Gray, a childbirth educator living in Ohio. "I avoided talking on the phone, I avoided any social situation because it was so bothersome," she says. She stopped working for months. 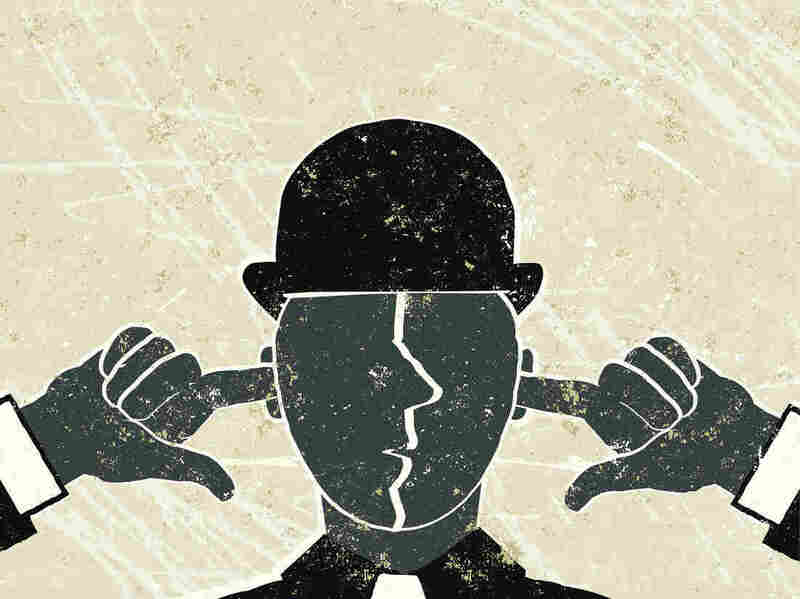 Doctors writing Thursday in the journal JAMA Otolaryngology-Head & Neck Surgery found that about 1 in 10 U.S. adults reported experiencing tinnitus within the past year. And, surprisingly, very few of them talked with their doctors about one of the few methods known to help with it. "Tinnitus is intimately tied to hearing loss," says Harrison Lin, an ear surgeon at the University of California, Irvine Medical Center and an author on the report. When a person loses the ability to hear a certain range of sound, their brain might chime in with its own iteration, like a soldier who can still feel pain in a limb they've lost. "You hear a sound — a buzzing, a hissing or a tone — and no one else hears it. It's generated by something in your brain," says Lin. Looking at a national survey of more than 75,000 people, Lin and his colleagues found that about a quarter said they'd experienced symptoms for more than 15 years. Over a third said their symptoms were nearly constant. According to the U.S. Department of Veterans Affairs, more than a million veterans get disability payments for tinnitus. Tinnitus: Why Won't My Ears Stop Ringing? For a lot of people, tinnitus is minor enough that they don't consider it a problem. But in cases where the sensation is intolerable, it's connected with anxiety, depression and lower quality of life. Lin says one way to counteract it is to get hearing aids, so that the brain stops trying to compensate for the silence. The other thing known to help with tinnitus sounds a little odd coming out of a surgeon's mouth — psychotherapy. "Cognitive behavioral therapy is widely accepted and promoted by our national professional society, but very few people know about it," says Lin. "It's about converting the way in which you think about tinnitus from negative emotions and trains of thought to more positive trains of thought." For example, Lin says, a patient might be limiting their activities because of negative thoughts around their tinnitus. The therapy would help them take the bad thought, like "My tinnitus is very bad today, and I won't enjoy going out to dinner with my spouse, so I won't go," and turn it into a good one, like "I have tinnitus, and it may be distracting at times, but I will likely enjoy spending time with my spouse, delight in the meal and have an otherwise great evening." Participants also learn relaxation techniques, how to manage sleep better, and ways to reduce their fear about encountering unpleasant sounds. Despite studies showing the effectiveness of behavioral therapy, doctors rarely bring it up with patients. According to the survey Lin studied, about 0.2 percent of respondents with tinnitus had talked about it with their doctors. Jennifer Gans, a psychologist with a private practice in San Francisco, is pushing for another form of therapy for tinnitus patients, mindfulness. The evidence for its effectiveness is a lot harder to come by than for cognitive behavioral therapy, but it operates on the same assumption — that changing a person's attitude about their affliction can minimize its impact on their life. After learning about how mindfulness could help people with chronic pain, Gans decided to apply the method to tinnitus. She now has an online course in stress reduction to help people cope with the infuriating sounds. "There's this great quote that 'Pain in life is inevitable, but suffering is optional,' and it really stands true," she says. Gans asks participants to meditate for half an hour every day, learning to live with the tinnitus rather than harping on it as a burden. In the first lesson, she asks participants to pick up a raisin and focus on each detail — the texture, the sound of it rolling between two fingers, the look, taste, smell. She even asks people to notice the feeling of being "one raisin heavier" after eating it. The idea is to help people learn to control their focus and their stress so that when something out of their control happens, like a loud ringing in their head, they can keep calm and get on with their daily life. She says some people initially say, "No way, I'm not into that mumbo-jumbo stuff." But when all else fails, they tend to come around. Linda Gray, who eventually took Gans' course, was initially among the skeptical. "I'd done hearing aids, acupuncture, massage, tinnitus retraining therapy, and there was nothing else left," she says. She doubted that an online course involving a yoga mat would do much to help. But, she says, "I had to get on with my life. I couldn't just sit in my bedroom listening to white noise for days or weeks at a time. "I'd still prefer it to be gone. As we're talking now, I can hear it," she says. But, she says, "I have some tools now to cope with it, rather than panic." Though few studies have shown the effectiveness of mindfulness for tinnitus patients, a few studies have shown that combining mindfulness with cognitive behavioral therapy can reduce the negative psychological impact of chronic tinnitus. Lin and his colleagues at UC Irvine have created their own eight-week online course in cognitive behavioral therapy. They're now enrolling patients at the medical center in a trial to understand how much it helps improve their quality of life.